PITTSBURGH (AP) -The Carolina Hurricanes always seem to leave Pittsburgh with a victory and a scary injury. Eric Staal got Carolina's go-ahead goal early in the game to win his personal matchup with younger brother Jordan Staal and the Hurricanes overcame a second frightening injury in Pittsburgh in seven months to beat the Penguins 5-1 Saturday night. A night after needing Ray Whitney's goal with half a second remaining to beat Atlanta 4-3 for the Stanley Cup champions' first victory in five games, Carolina effectively wrapped this one up in a few minutes. Scott Walker scored midway through the first period for the first of his two goals, and the Hurricanes were in control after that to improve to 8-1-1 in Pittsburgh since the 1999-2000 season. Walker's first goal came less than a minute after forward Trevor Letowski was carried off on a stretcher with a concussion, leaving behind a pool of blood on the ice from a forehead gash. Letowski was leveled on a blindside hit by Pittsburgh's Colby Armstrong moments after making a pass and lay motionless for several minutes. 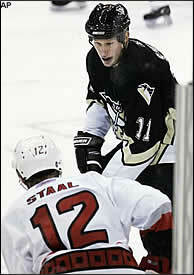 Jordan Staal (11) defends against his brother, Eric in the first ever meeting between the siblings on the NHL level. Letowski, in his eighth NHL season, was playing again after being a healthy scratch Friday. Despite being knocked unconscious briefly, he returned to the team in time to fly home after receiving stitches to close the gash in a nearby hospital. Armstrong was not penalized, but Laviolette was unhappy Letowski was leveled without being able to protect himself. "It was a tough hit, it was unfortunate," Laviolette said. "You can make argument it was a little bit late. He had passed the puck, it was gone, one second, two seconds, and Trevor didn't see it coming." Armstrong defended the hit, but said he felt "awful, sick to my stomach" and had trouble keeping his mind on the game after that. "It was a little tough," he said. "I had to take it a shift at a time. ... The other guys told me it's part of the game, but it was tough. I'm not a dirty player." Erik Cole, Carolina's standout left wing, did not score in his first game in Pittsburgh since breaking his neck while being rammed into the boards from behind by Pittsburgh defenseman Brooks Orpik on March 4. Cole missed the rest of the season and did not return until Game 6 of the Stanley Cup finals. "Last year it was Erik (Cole) and this year it was Trevor," goalie Cam Ward said. "It (Letowski's injury) was an unfortunate situation and was tough to watch on the ice." This time, Eric Staal scored his third goal of the season and fifth in five games against Pittsburgh the last two seasons when he swiped the puck off rookie defenseman Kristopher Letang's stick and put it past goalie Marc-Andre Fleury in a single motion about 2 1/2 minutes in. Jordan Staal, an 18-year-old Penguins rookie playing against his older brother for the first time in the NHL, did not score one game after getting his first NHL goal. "We didn't talk before the game, but I was text messaging him during lunch and we had some good jabbers going back and forth," said Eric Staal, one of four hockey-playing brothers, three of whom have been drafted by NHL teams. "It was the first time I had played against one of my brothers (professionally) and it was different. "Pittsburgh, outscored 7-1 at home in losing its last two games there, tried to get back in it by holding Carolina without a shot during a two-man advantage that lasted 1 minute, 57 seconds in the second period. But one second after the second penalty expired, Walker got his second goal of the game and third of the season by redirecting Whitney's pass past Fleury. Fleury was lifted three minutes later with a cut near an eyebrow after allowing three goals on 20 shots, but he was not seriously hurt. Jocelyn Thibault replaced him for his first game action since undergoing hip surgery in January. Notes: The Letowski injury occurred a night after Carolina, already missing forward Cory Stillman and defenseman Frantisek Kaberle with shoulder injuries, had forward Andrew Ladd (arm) and defenseman Bret Hedican (upper body) go down. Hedican apparently injured a shoulder, but his status is uncertain. ... Mike Commodore added his first goal of the season in the third period and had an assist. Whitney had two assists. ... The Staal vs. Staal matchup may not be repeated this season since Pittsburgh is expected to send Jordan Staal back to his junior team before his NHL contract would kick in at 10 games.